Chopping down trees too tedious for you? Keep getting lost in your own mines? Tired of farming crops for ungrateful pigs? Why not let those lazy villagers do the work while you sit back and reap the rewards? 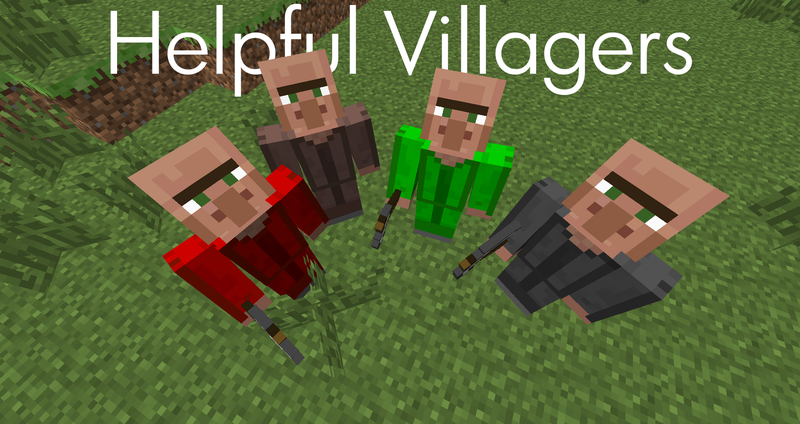 With Helpful Villagers you get to do just that and more! rendered the mod unplayable. One of the rules of this forum is to never ask a modder to update/downgrade their mod, so if you ask me to downgrade to 1.7.2 or earlier I will not hesitate to report you. When will a 1.8 version be released? - When 1.4 is out of beta and fully released I will try to upgrade the mod to 1.8 and release all future updates in 1.7.10 and 1.8. It will probably be a long time before I release a 1.9 version. Why isn't my miner working? - I fixed a bug with the Miner code but only applied it in beta. If you are playing on any version before 1.4.0b2 your Miners will still be buggy. How do I use create a Construction Fence? - Combine a fence with black and yellow dye in any configuration. Why can't I create guild halls? - People have been having problems with this since Day 1 and I've tried to make guild halls easier to set up and will continue to. 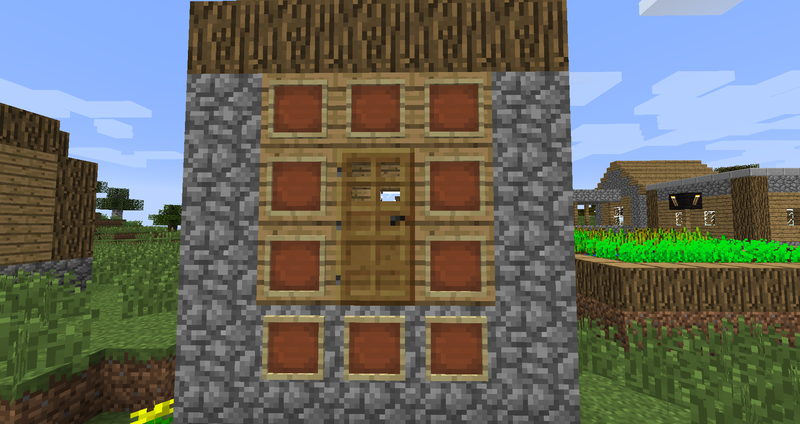 The best advice I can give you right now is to make halls closer to the "center" of a village (either where villagers congregate the most in a generated village, or the area where you first spawned a villager in a man made village) and make them small,simple buildings. What do villagers do if a guild hall is destroyed? - If the item frame still exists they will continue to use it but may have trouble finding chests/furnaces/workbenches inside the building. If the item frame is gone and there are no other halls of that type in the village most professions will stop working. Only Merchants, Soldiers, and Archers will continue to perform their function. I know I've missed a lot but hopefully this answers some of the more frequent questions. Hopefully I can put together a wiki sometime soon so we all have an easier way of sharing information. 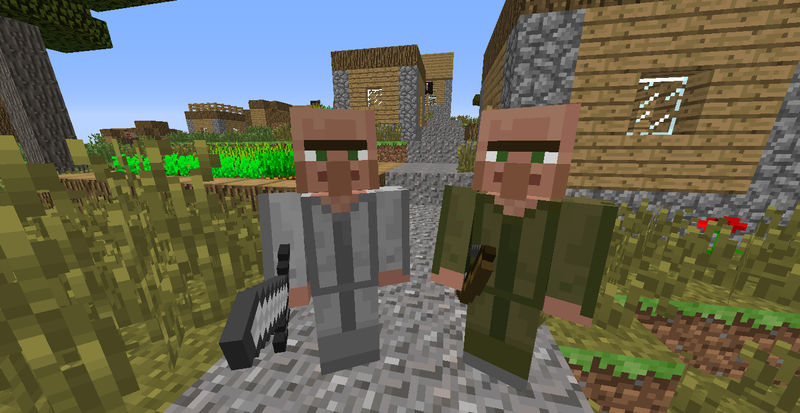 Better Models - Villager models now resemble player models, no more crossed arms and big noses. More Interaction - Villagers are no longer walking trading posts. 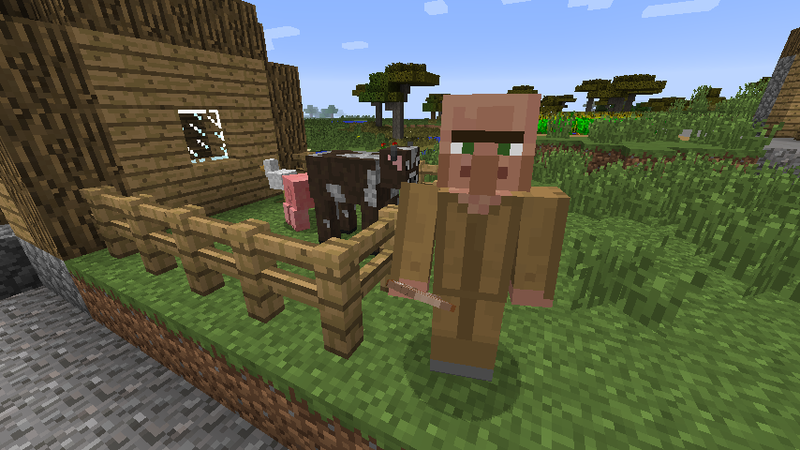 Now clicking on a villager will bring up a set of commands that will make the villager follow the player, trade with the player, or change its profession. 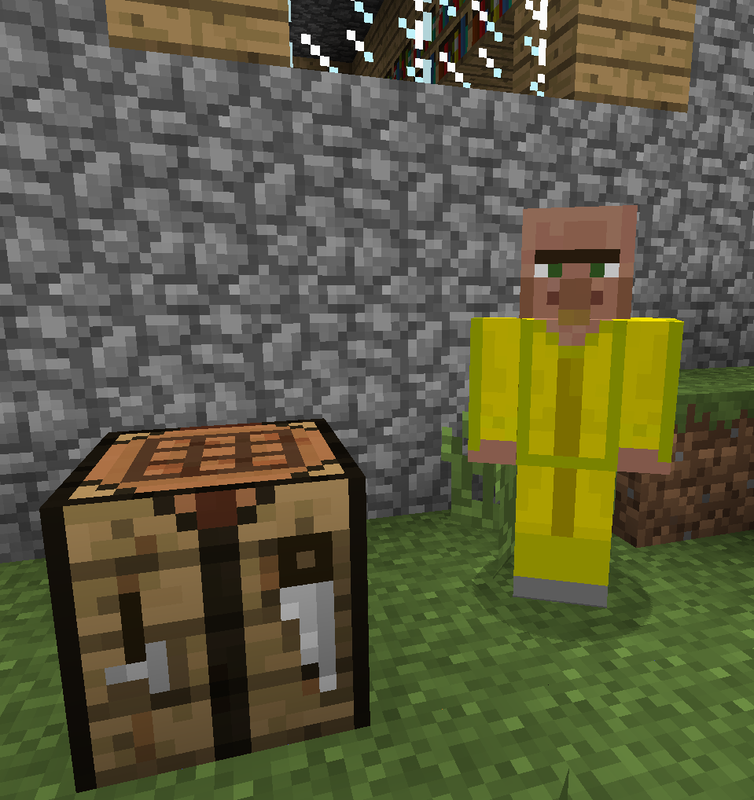 Villager Inventory - Villagers can now carry as many items as a small chest which the player can access at any time. 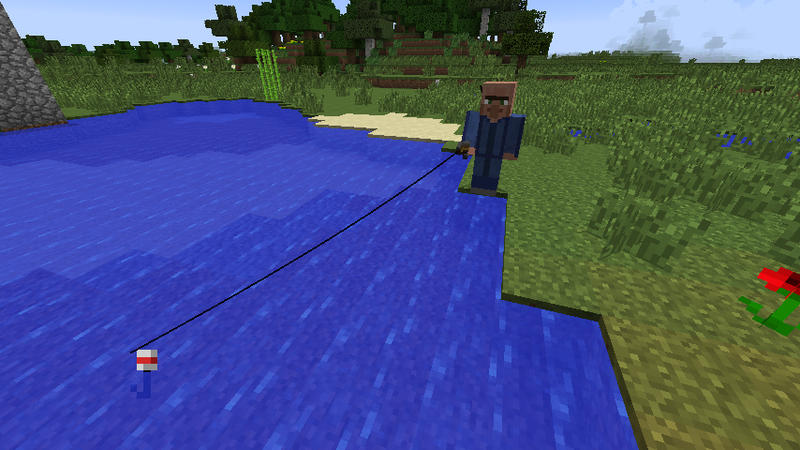 Also, villagers can now equip functional armor and a held item which they use to perform certain tasks. Working Professions - Unlike in vanilla Minecraft, a villager's profession does more than just determine what type of items he can trade. Now not only do villagers perform complicated tasks based on their profession but they do them almost completely autonomously, just give them the tools to get the job done and leave the hard work to them! Guild Halls - When a villager isn't working he will return to his guild hall to resupply and store any items he has collected for you to pick up at your leisure. More Professions - Look forward to your villagers doing a lot more interesting and useful things. More Interactivity - Players and villagers will be able to interact and communicate with each other easily and more naturally. Much more with your support! 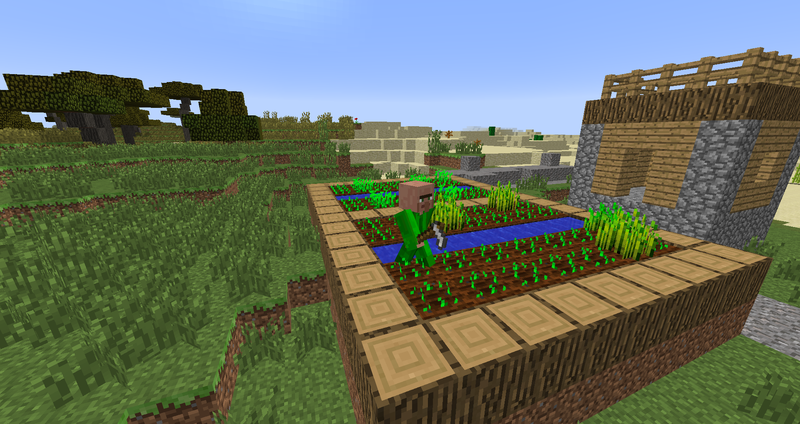 will harvest all fully grown crops, replant new ones, then come back to check on them the next day. 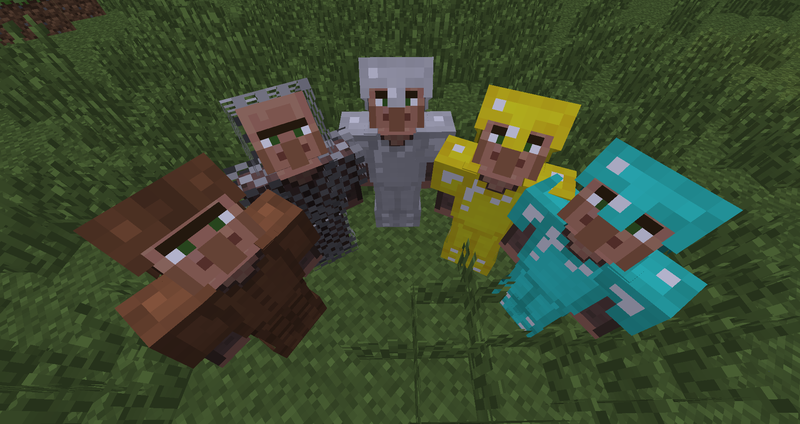 All villagers can be equipped with armor to protect them. Also, villager health now slowly regenerates over time. A guild hall must be built before changing a villager's profession. To build a guild hall you must first choose a building that has a door. Once you have the building you want place an item frame next to the door in any one of the places shown above then place an item corresponding to the profession you want the guild hall to be (for example, axe for lumberjack) on that item frame. Now you should be able to change the profession of your villagers. Soldiers and Archers will use swords and bows, respectively, to protect their village from hostile mobs. They will also, on command, follow and protect individual villagers. Merchants allow the player to buy and sell items in exchange for emeralds. Fishermen fish from bodies of waters outside of the village. They are also able to harvest ink sacks from nearby squids. The rancher captures animals from outside the village and brings them to the guild hall. If there is a fenced area attached to the guild hall, the Rancher will place captured animals inside this area instead of in the guild hall. The Rancher can also breed, slaughter, and shear animals that have been captured and placed in guild hall or fence area. Special thanks to TheDiamondMinecart for the mod showcase. Special thanks to Jaden Man for the mod showcase. You may include this mod in any modpack as long as you give credit to me and/or link to this forum thread. I also request (but do not require) that you send me a link to the completed modpack. I will provide support for mod compatibility related issues but will not be held responsible for any modpack featuring Helpful Villagers which does not work correctly. You may re-distribute this mod on any website provided that you only use the adf.ly links included in this thread. You may create any YouTube video that showcases this mod. Tell Me What You Want - If you have an idea for something that should be improved, removed, replaced, or added leave a comment or send me a message. Be Artistic - I am by no means an artist, so if you think you can design better skins, GUIs, or even web content then show me what you come up with and I might just use it. Share - If you know someone who will like this mod as much as you did share it with them by sending them the download link above. - Not only does receiving donations help free up my time to work on the mod, but it also shows dedication from fans of the mod, and the more dedicated the fans are the harder I'll work. The download should work but you may have to disable any popup blockers and/or pass a security check on your web browser. This mod looks like it has tons of potential. I would like to see a builder and a guard. The builder could be programmed with making vanilla village buildings. The guards could be like the NPC's in MCA and be warriors to protect the village. I can hardly wait to see what you have next. If Minecraft were real, you'd be a zombie right now. Thanks for your input, and actually those were two professions I was already planning on implementing lol. OpenGL: ATI Mobility Radeon HD 4200 Series GL version 3.3.11672 Compatibility Profile Context, ATI Technologies Inc. Cool, sensible mod! I like where it's going. I got the crash report when I was in creative mode on a brand new save file. I was spamming the mods' villagers (about 10?) and they were all the farmer ones, in brown robes. I clicked on the button to change it's profession, then I crashed. OpenGL: AMD Radeon HD 7300 Series Graphics GL version 4.2.12002 Compatibility Profile Context 9.12.6.0, ATI Technologies Inc.
@AllRangerOfficial Make sure you're running 1.7.10, there were some fundamental errors in 1.7.2 and earlier code that led to constant crashes. @TwinkleAndKessie As best as I can tell you were on a world that did not have a village loaded (either because you were not close enough to one or there were none generated in the first place). I'll make sure to fix this so that it doesn't cause a crash but you still won't be able to switch professions. For now just make sure you are in an actual village before attempting to change professions. Both of you have my thanks! The the trade button doesn't seem to function. It just brings up the villager inventory. Merchant - villager that consolidates all nearby villager trades into one place. 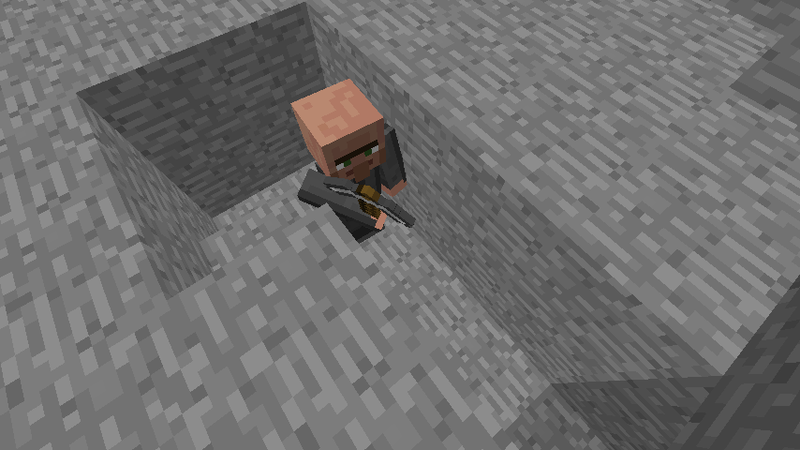 Golem Tinker - villager who will create iron golems if you give them the materials. Add functionality for the guild hall to create new ones where the player specifies. Add functionality for setting a new town location like building a well. So after further play time with this mod, it looks like it overrides the villagers added by other mods like Witchery, Tinkers Construct, and Thaumcraft. This would be very undesirable for the modded minecraft community. For example, MCA adds similar functionality as this mod but does not override other mod additions. Xbox: Why Would I Answer That ? I got here from DanTDM and I LOVE this mod!!!!! @Skullcracker445 Make sure you are have the latest version of Forge installed. If the problem still persists PM me with more details. Awesome mod Maybe make them fight for you like wolves? Will there be minecraft comes alive compatibility? @Skullcracker445 Oops, uploaded wrong file last time, redownload and it should work.